The Auckland Skiff League, home to the New Zealand 18′ Skiff Fleet, will play host to the Australian’s and a loan American crew for this years edition of the Maersk Line 18′ Skiff ANZAC Regatta. Racing starts at 1500 hours New Zealand standard time on Friday 22nd April, on the waters of the Waitemata Harbour with awesome spectator spots on North Head, Orakei Wharf and Bastion Point. 16 boats are set to hit the start line, including the crew from Yamaha who are currently the most successful team in New Zealand. 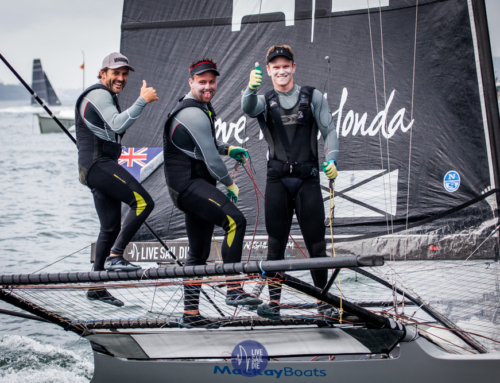 David McDiarmid, Brad Collins and Matthew Stevens finished second at the recent JJ’s regatta in Sydney, the best result for a kiwi boat since 1942. 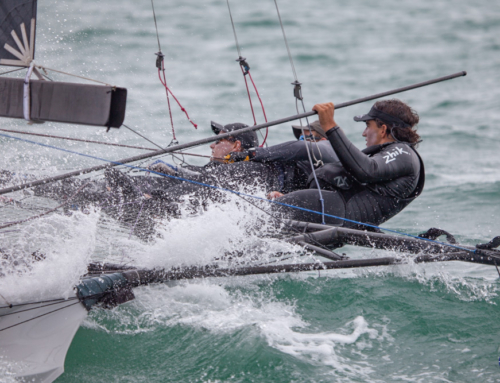 The team also hold the current NZL Title and will be ready to take on the Aussies on their home waters. Stephen Jones, event organiser for this years regatta, is “fizzing” about the impending racing. Jones and his crew on Events Clothing are counting down the days until the event gets underway. “This will be the biggest regatta we have hosted in over 40 years and it’s just awesome to see the Kiwi 18′ Skiff fleet coming back to life. The concept of New Zealand verse Australia in a traditional ANZAC event, as well as having a team from the USA is just brilliant. Traditionally we get strong breeze during the ANZAC long weekend and I know we are looking forward to some epic sends, and potentially some spectacular crashes,” said Jones. The Auckland Skiff League sailors now call Royal Akarana Yacht Club home after the 2015 merger between the Auckland Sailing Club and RAYC. The crews will be treated to some good ‘ol RAYC hospitality after sailing, with plenty of banter happening between the teams.